King’s Day, or the Epiphany, marks the official beginning of the Mardi Gras season! This is the first day many people believe you can officially indulge in King Cake and the sweet treat is a party staple until Mardi Gras day on March 5th. Celebrate the beginning of the 2019 Carnival season with the Phunny Phorty Phellows! Instead of using traditional floats, the Phunny Phorty Phellows also ‘Herald the Arrival of Carnival,’ the krewe loads up on a street car and rides all way the down St. Charles Ave. - from Uptown to Canal Street - and back. The Phellows, who first took to the streets in 1878 (with a long break that lasted from 1898 until 1981) is known for its satirical costumes. This year’s streetcar ride begins at the Willow Street Car Barn at 7:00 p.m. and will make its way down to Canal St. and back. Another parade! The Krewe de Jeanne d’Arc parades every year on the birthday of Joan of Arc every year, January 6. This is the 11-year anniversary of the parade celebrating this French war hero.The walking parade features a medieval-themed procession through the French Quarter -make sure you’re in your spot to catch the spectacle at 6 p.m. sharp. Brought to you by Broadway New Orleans, Les Misérables is coming to the Saenger Theatre for one week only during the month of January. Purchase tickets here. Participate in City Year New Orleans’s Day of Service on MLK Day, January 21st, 2018 if you’re looking to volunteer. 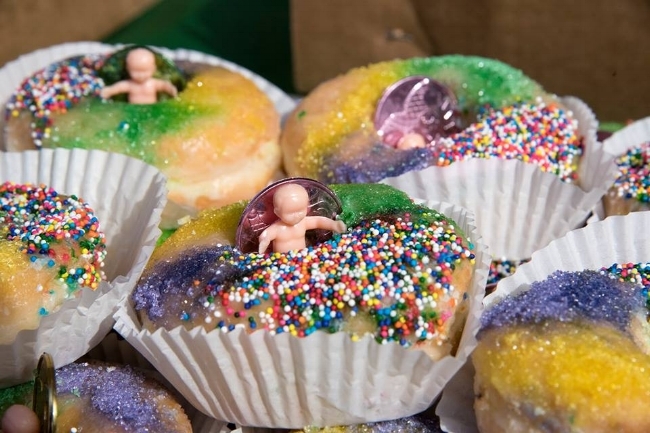 At King Cake Festival, over a dozen local shops offer samples of their King Cakes, so you can try every variety. The festival also features food trucks, live music, and drinks. At the end of it all, vote for your favorite dessert! The festival will be held in Champion's Square on Sunday, January 27th from 10 a.m. until 4 p.m. Vendor booths will be located within the square, and a stage playing live music will keep your spirits high. Visiting New Orleans this January? Let us know on Facebook, Twitter, and Instagram using #soloNOLA!